← Learn to Sew This Summer! Best Books for Boys, And Girls, Too, if They Like Adventure, Blood and Gore! I have found the best books for boys, and even girls who are into adventure, blood and gore. Especially if any of them are reluctant readers. These books are the Hazardous Tales Series from Nathan Hale. The one pictured above is about WWI. All of these books are graphic novels, a fancy name for comic books. What I love about these books is that the author and illustrator, Nathan Hale, has such a knack for visual storytelling. He is so ingeniously creative! So as you read, you are painlessly learning history at the same time. In the WWI book above he uses a different animal to represent each nation involved in the war. So, Britons are bulldogs, Serbians are wolves, Russians are bears, Austrian-Hungarians are griffins, Germans are eagles, and Americans are…bunnies! (That’s right, not bald eagles!) That innovative feature, combined with the cool maps that Nathan includes in the book has allowed me to remember how the war got started and who was on which side. Even though I’ve taught a class about it, and passed the AP History Exam, I would get confused by all the nations involved and who was on which side. Since I am a visual learner I will remember from now on that the Serbs were against the Germans and Austria-Hungarians, because of the animals and the maps in the book. I highly recommend this book, along with the other books Nathan has written and illustrated, featured below. They all have 4.5 to 5 stars on Amazon, and I give them 5 stars too! If you care about going in order when reading a book series, you will want to read the book below first. It sets the stage of the three main characters who appear in each book: Nathan Hale (the real person who was caught spying in the Revolutionary War, who coincidentally has the same name as the author, although they are not related), the Hangman, and the Provost. After that, it doesn’t really matter what order you read them in, unless you want to go in historical order, of course. I have had so much fun coming up with different voices for these characters as I read One Dead Spy aloud to the kids. Trying out British, German, and Russian accents for the WWI book has also been delightful. 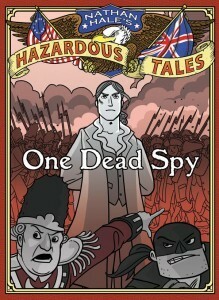 This one is about the Revolutionary War, called One Dead Spy, about Nathan Hale. Again, the maps have helped me better understand the history I’ve heard over and over through the years since my public school classes. 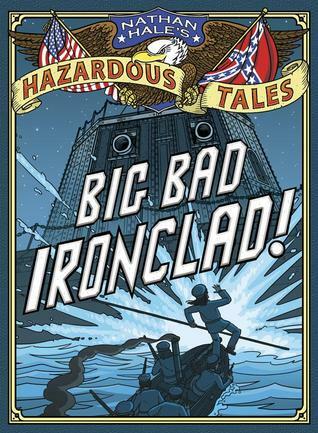 This one is about the War Between the States, aka the U.S. Civil War, called Big Bad Ironclads. I was disappointed it only covers navy battles. It’s still great though! I guess I will have to wait for Nathan to do one about the land battles. This one above is about the Donner-Reed Party. Nathan managed to pull off his balance of mixing tragedy with comedy without being offensive. We are talking about cannibals here, after all. He is such a gifted storyteller! The one pictured above is about WWII and Jimmy Dolittle’s Raid. We haven’t read it yet but I’m confident it’s just as grand as the others. Then this one is about Harriet Tubman and the Underground Railroad. It is heart wrenching to see all of the abuse she underwent, yet inspiring to see her rise above it as a hero. I didn’t know she had fainting spells from being hit in the head until I read this book. We are reading this one about Texas history and the Alamo. I had no idea so many people were involved in the early history of Texas. Now I understand the Six Flags thing. Santa Anna, Jim Bowie, Davy Crockett, Stephen Austin, there are all here. The newest one, due out October 2018, is also about the Revolutionary War. Feauring the Marquis de Lafayette, the French nobleman who was Washington’s buddy in training the colonial soldiers, it’s sure to be another hit. I can’t wait! You can read one interview here and another with him here. Then here is his blog. He hasn’t added to it in over a year, hopefully that means he is hard at work!